Manufactured from the very highest quality raw materials available and to the strictest quality standards, hollo elastic delivers trouble free, consistent performance. Hollo elasrtic is available in six different strengths to suit all fishing situations from 9H up to a ver powerful 19H. Thoroughly tested, Hollo elastic comes in 3m lengths in a sealed bag to ensure it stays in perfect condition. 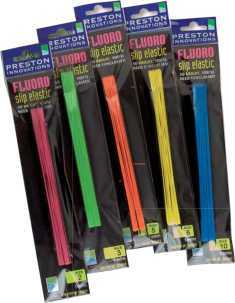 Slip elastic was the first colour coded elastic available and is still incredibly popular with anglers. Pre treated with Preston Slip lubricant to give outstranding abraision resistance and reliability it is available in 5 metre lengths from ultra fine size 1 to size 16. Available in eight sizes, this high quality pure latex is graded in both diameter and traditional numbers to enable the angler to make an informed comparison. 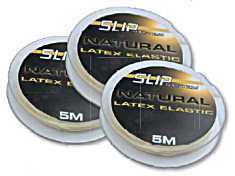 Supplied on spools and in five metre lengths, this elastic has a super smooth surface and consistent stretch, allowing it to flow smoothly from your pole tip to give the ultimate performance as well as reducing the number of lost fish.